Mega-restaurateur Wolfgang Puck has launched his own boutique wine label, developed with California’s Delicato Family Vineyards. The four varietals of Wolfgang Puck wines are now on the menu at most of Puck’s fine dining, non-airport restaurants across the country. According to the official release, a glass of Puck’s wine runs about $8, and bottles cost about $32. A portion of wine proceeds will be donated to the Keep Memory Alive Foundation. More details in the full release. Los Angeles (June 2, 2011) – Wolfgang Puck debuts his eponymous wine label, Wolfgang Puck Wines, a portfolio of personally selected favorites produced by Delicato Family Vineyards in California. Now available on wine lists in most Wolfgang Puck Fine Dining Group (WPFDG) restaurants nationwide, Wolfgang Puck Bistro locations and Wolfgang Puck Catering venues, the private label focuses on a collection of food friendly wines that deliver incredible value far beyond their price points. Wolfgang Puck Wines are a collection tailored to suit any palate. After researching, developing and tasting with the winemakers at the Delicato Family Vineyards for a period of more than two years, Puck’s boutique label debuts with four initial varietals in the 2009 vintage: Cabernet Sauvignon, Merlot, Chardonnay and Sauvignon Blanc. Accessibly priced, family-produced and created with intense varietal character, these wines signify the spirit of food and life for which Puck is known. 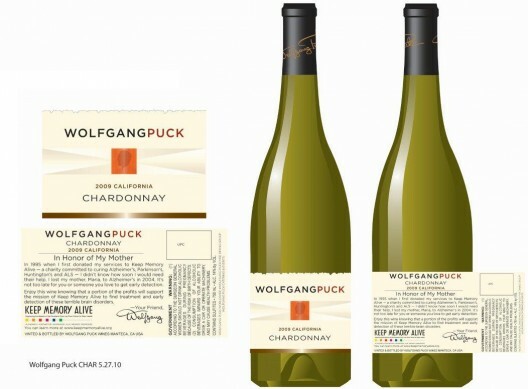 Family plays a major role in the culmination of the new Wolfgang Puck Wines label, with a portion of the proceeds from the sale of each bottle generously donated to the Keep Memory Alive Foundation (KMA). Originally founded in 1996 by Las Vegas businessman Larry Ruvo, who held the inaugural memorial dinner at Spago in his father’s memory, KMA has since raised over $95 million towards research and a cure for neurocognitive disorders. In honor of Puck’s mother, Maria, whom he lost to Alzheimer’s in 2004, the proceeds generated will directly contribute to research a cure to brain-related diseases such as Alzheimer’s, Parkinson’s, Huntington’s and ALS. Puck’s unique, personal attention to the winemaking process is reflected in each and every aspect of Wolfgang Puck Wines. The cuvées are specifically selected by the master chef to emphasize approachability, with prices averaging $8 per glass and $32 per bottle. The distribution of Puck’s wine philosophy is impactful and immediate, directly translating to a dining audience of more than 50 locations around the country. For more information, please visit www.wolfgangpuck.com.